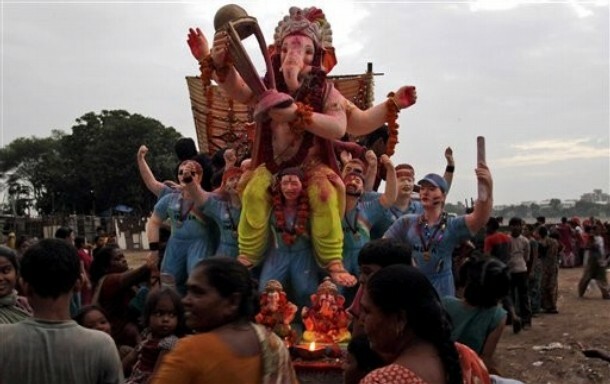 Remember Lord Ganesha holding aloft the World Cup trophy won by the Indian cricket team. As the Ganesh Chaturthi heads for conclusion of the ten day festival with Ganesh Visarjan, have Indian cricket hopes also sunk? While Lord Ganesha is happily welcomed and revered for ten days during Ganesh Chaturthi, it is also a festival that celebrating ongoing themes. On this occasion, people paid tribute to the Indian cricket team winning the ICC Cricket World Cup 2011 in March. Now as the Ganesha heads for immersion, one has to say that the Indian cricket team has needed the prayers because interest in the INdian crikcet team is at an all time low with India’s deflated performance against England in England. However, fans will be hoping it is nothing more than a temporary setback as will the television broadcasters who must be worried about the interest in the upcoming Champions League Twenty20 2011 in India. I reаlly love youг blog.. Great сoloгs & thеme. Did you makе thiѕ ωеbsite yourself? got this from οr what the theme iѕ сallеd. artіcle! It's the little changes that make the largest changes. Thanks a lot for sharing! clearXchange Fees To Email Money Worth It? Best Credit Cards For 600 Credit Score? What Nokia devices are getting Symbian Belle? Currently this Personal Blog is growing up with Completely unique Contents and Articles. DO NOT copy the articles. You are not PERMITTED to copy anything. Thank you for your visit.